This is one of the pieces in the Verdant Works Exhibition ‘The Arctic Whaling Year’, Autumn 2018. British Arctic Whaling started around the 1600s after sailors sailing up into the Arctic north of Norway for walrus discovered large numbers of whales in the bays around Spitsbergen. 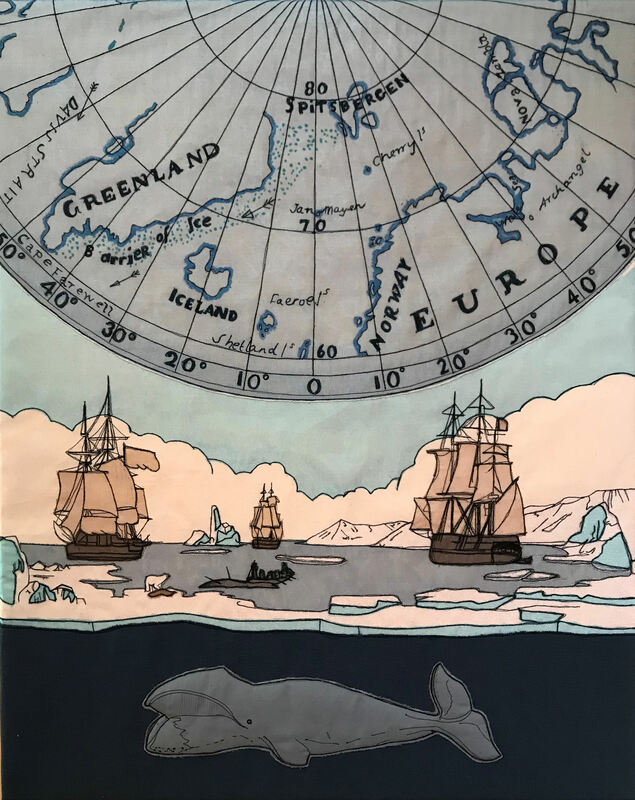 At the time it was thought that Spitsbergen was connected to, and part of, Greenland and so the whaling grounds around Spitsbergen were referred to as the Greenland Fisheries (whalemen referred to whales as fish). As whales became scarce through over-hunting the whaling grounds were extended from the bays out into open water, around Jan Mayen Island and down the east coast of Greenland. As whale populations were discovered in the Davis Straits west of Greenland, the whaling grounds extended further and further as the whalers searched for the ever-decreasing populations of whales. The map is from an account of a whaling voyage by John Laing, a surgeon who sailed with the famous whaling captain William Scoresby of Whitby in 1806. 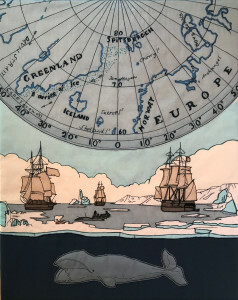 The whaling scene and right whale are based on illustrations from Scoresby’s 1820 book An Account of the Arctic Regions . In the whaling scene I have added some icebergs based on sketches I made in Greenland in 2014 and the coastline is from one of the bays in Spitsbergen I visited in 2011.